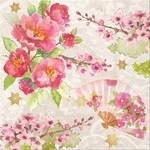 Punch Studio has a plethora of floral designs! Featuring roses, peonies, dahlias and other gorgeous blooms, beauty in all colors can be seen on these fine items. Anyone with an appreciation for flowers is sure to find something they adore!